Dessert should really be considered one of the major food groups, don't you think? Chocolate dessert recipes, in particular. That's why we've put together this giant collection of 108 great chocolate dessert recipes for you! Looking for chocolate dessert recipes for cakes? We've got 'em. 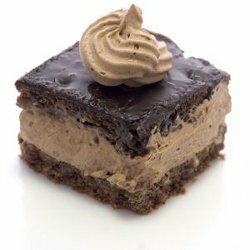 Trying to find fantastic chocolate recipes for mousse? We have those too. If you're looking for cookie-type chocolate recipes, we have lots, and we've got chocolate drink recipes, chocolate recipes for brownies, pie with chocolate recipes, and more. Peruse these 108 great chocolate dessert recipes...we're confident that there will be several you'll want to try! I found the recipe for a dessert much like ther photo, tried to print but either my printer had a fit or the website chose to delete it. The dessert had a filling that called for instant vanilla pudding mix, crust was a crumb type and had a delicious chocolate glaze. So, what happened to the recipe and why is it gone?!!? Can you send all this ebook for me, please? I need them all. I want to try all the recipe. Please make it available! There is a picture of a chocolate dessert at the top of this article that looks delicious. It looks like a chocolate crumb crust, a chocolate mousse filling, and a chocolate fudge topping cut in a square. Can you please give me the name and recipe of the this dessert? I really wanna make it but want to get the right recipe. I agree with Christiene, Please make this an ebook download. When i go to desserts table of contents there is a picture of a chocolate dessert with chocolate whipped topping on top and it is cut in a square. the center also looks like it has this whipped topping in it.Can someone tell me which recipe is for this?I really wanna make it but want to get the right recipe. I wish that this was in an ebook download. If you have a table of context why not have it in an ebook format?